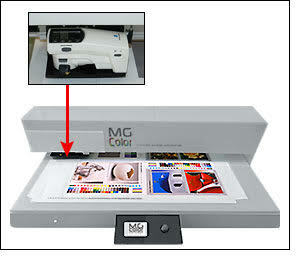 Konica Minolta FD7 Spectrodensitometer built into the automated scanning table from MG Color. InkZone Control by Digital Information replaces outdated color measuring technology with the latest generation of scanning devices, extending the life of printing presses. While the machinery that powers the average offset press can easily last for up to twenty years, the lifespan of the color measuring technology which controls these presses pales by comparison. Historically, ensuring the relevance of a press by making the transition to a modern color measurement system has been both cost-prohibitive and difficult. Now, however, the innovators at Digital Information bring to market the affordable InkZone Control solution, enabling the connection of modern color measurement scanning devices to legacy offset presses. Compared with the cost of a major capital overhaul involving the complete replacement of older offset presses, connecting to the latest scanning instrumentation represents a smart investment which yields the addition of several years of competitive life to the press under optimal conditions. 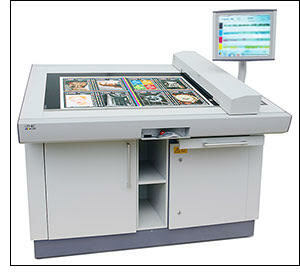 Automated 2D spectral and density measuring table LithoScan Professional made by Lithec. InkZone Control interfaces with the latest high-performance color scanning technology from Lithec, Konica-Minolta, X-Rite, and Techkon. With InkZone Control, these industry-leading color measurement devices are integrated into the press manufacturers’ control consoles via existing interfaces without impacting the system’s measuring process or operation control. Quality control can be performed with conventional color control strips. InkZone Control by Digital Information supports virtually all generations of control centers, including those from Heidelberg, KBA, manroland, Komori, Ryobi, Mitsubishi, etc. InkZone Control is fully compatible with the entire InkZone suite, which includes ink key preset, color reporting, and InkZone Instrument Flight by System Brunner.